An intelligent life form inhabiting a planet in a distant solar system comes within a cat’s whisker of destroying itself when a rocket carrying nuclear waste for disposal in outer space explodes shortly after launch. The sophisticated space programme is cancelled and launches of anything larger than an eye-ball are forbidden. In order to occupy the minds of all the out-of-work scientists (and prevent further blunders), they are ordered to search for life elsewhere in the Galaxy and, if discovered to prevent it/them from achieving space-age status and so making the same mistake. To ensure the mission will never succeed and thus the scientists will be fully occupied for ever, the President adds a few sneaky provisos. The scientists headed by the brilliant Boffin send thousands of golf-ball sized probes manned by robots flashing through the near reaches of the Galaxy searching for life. As the home planet is about to be destroyed by an asteroid (because the rocket-based defence shield has been de-commissioned), the last tiny space-probe to be fired carries with it the computerised intelligence of the Boffin. This probe discovers life on Earth in the year 550BC and sends a disguised robot down from orbit to carry out its mission of disinformation. The robot-manufacturing equipment is faulty and makes a one-legged bird with massive foot instead of a human replica as was intended. However because this peculiar creature can converse with humans by thought transference, the scientists it meets think it is a god and its mission is made easier. For the next 2000 years the “Bird God” more or less successfully delays advances in navigation and astronomy, tricking everyone including Pythagoras, Ptolemy, Columbus, Copernicus, Kepler, Newton, Halley and even Nelson. It succeeds partly because it is continually being refurbished in a new guise – fourteen different mechanical birds and each apparently entirely unsuited to the next stage of the mission. Although this is a work of fiction, all the scientists and explorers mentioned in the story were real people. Their ideas, discoveries, inventions and adventures, which depict 2500 years of scientific navigation and astronomical development on our planet, have been carefully checked for accuracy. Factual events mentioned after the year 1650 are detailed in the author’s first Navigator Trilogy book “Astronomical Minds – The True Longitude Story”. 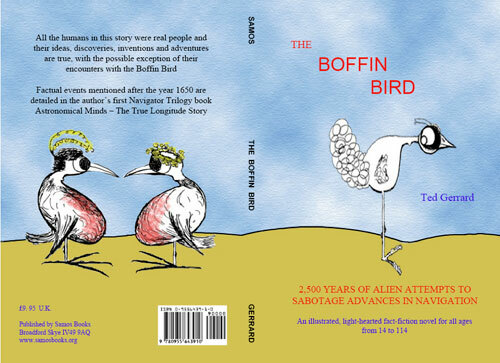 “The Boffin Bird” can be purchased from Amazon by clicking the button below. Language. English 6" x 9" paperback; 216 pages & 43 small cartoon sketches.